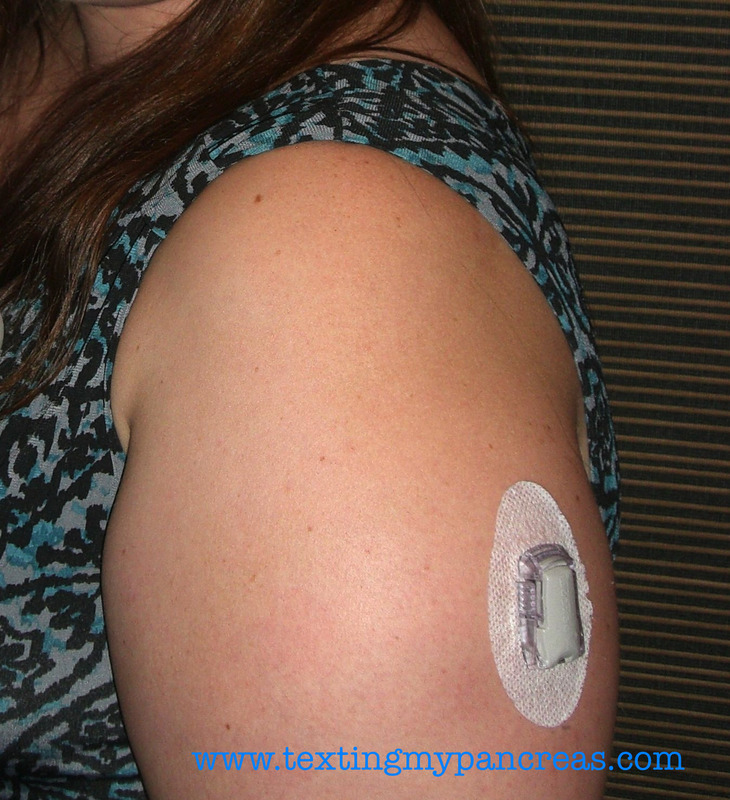 Texting My Pancreas: Diabetes On My Sleeve. Aaron and I were at a friend's post-wedding soiree (they got hitched in Vegas - photos looked beautiful! - and had a reception party at their home after they returned) on Saturday night. I was actually wearing the dress in the photo to the right there, so my Dexcom sensor was fully visible on the back of my arm. I knew very well that it was possible - likely, even - I'd get questions about "that thing on my arm", and I felt prepared and okay with that. If any medical professional out there wants to know what being involved with a community of fellow patients does for someone with diabetes, here's one thing: because I have read the experiences of others who have worn their CGMs out in the open, I felt confident in trying it myself. I didn't really feel ashamed or skittish either - in fact, I think I might have walked a little taller with that CGM sensor out in the open air. So there I am, plate in hand and spooning up some watermelon, when I feel something nudging my Dexcom sensor. I thought it was Aaron - maybe the tape was coming loose and he was trying to fix it? Nope. It was a lady I'd never met before in my life, with her hand on my Dexcom sensor. A lady who was old enough to be my mother - and therefore, old enough to know better, I'd think. I had been totally thrown off of my game. Questions? They are totally are welcome, and I was prepared for those. Touching? Totally a WTF moment. "Um, hi? ", I greeted her with. Still touching the sensor, she said in a very concerned voice, "Oh, my! Is this medication?" Her arm returned to her side. "Sort of. It's a glucose monitor. I have type 1 diabetes, and it helps me see what's happening." She paused. "Does it work?" "Yep; it works really well." I tried so, so hard to not make a "Is this really happening?" face, and returned to my meal gathering. I looked at Aaron, to see if he'd witnessed what just happened. His smile and subtle head shake told me that he had. The moral of this story? I'm not sure. But I do know that this situation didn't bother me nearly as much as it might have before I found the diabetes online community. Primarily because, even as it was happening, I knew that I'd have a story to share with people who could laugh at it right along with me. Having a support system of fellow patients helps me feel more confident in doing what I need to do in order to be healthy, and that's a great thing. Man..that's rough. I had a lady do the very same thing to my daughters insulin pump. It really got to me. My daughter gets flustered and can't think to even tell them what it is. Grrrr. We also had the service dog out and about and someone asked " awww is she blind?" I was horrified, cause if she had been she wouldn't have been deaf....I just shook my head and said " Nope they both can see just fine"....LOL! Geez.... Some people have nonsense of personal space. She probably rubs pregnant bellies, too! You wear it well!! Wear it proud!! 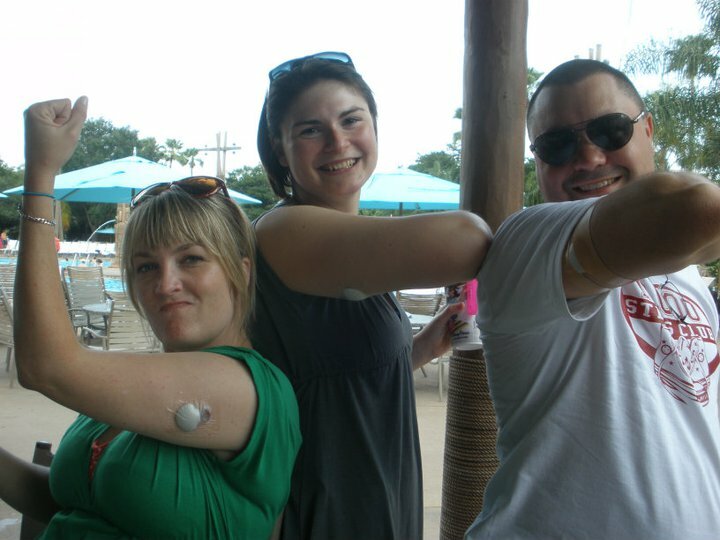 My favorite CGM-on-arm story is at a bar the other night, someone who had had a few too many touched my sensor (I think she was trying to point at it, but she missed...) and said "what is THAT?!" I told her, and she said, "OH! That makes way more sense. I thought you had a matchbox car taped to your arm." Wow... not sure I would've maintained my composure there. At least would have tossed some sarcasm at her. Maybe I would've said something like, "Yes, it's a medical device, no excuse me while I fondle parts of your body, stranger." Good for you for being an adult. Well done, Kim! I've been waiting for this post. OY! I'm just glad she didn't yank if off! I'm sure she meant well but geez personal space folks? Seriously expecting her to follow up with "Is this real life?" I once (very briefly) volunteered at my city's Parks and Rec summer camp. I was playing with the little kids, when one wrangled me down (I'm 5'2ish), took my pump from my pocket and started throwing it at me! Why do people think they can do stuff like that? I love the way you handled it, though admittedly I also loved the snarkier scenarios you gave...too funny! My 16 yo gets questions about her Omnipods all the time. What really irks me is when people won't straight out ask her, but sit there and point and whisper. Rude, much? Your story, Kim, gave me quite a chuckle. I'm new to the type-1 club (had my 1 month "anniversary" last week). 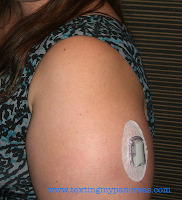 I'm getting a Dexcom CGM this week - Hurray! I always say "please stop touching my pancreas"